Pinterest can really be a wonderful resource for finding inspiration from your wardrobe, to new recipes to home decor. A few pins that have stayed with me below have me dreaming of amping up all different elements of my life. 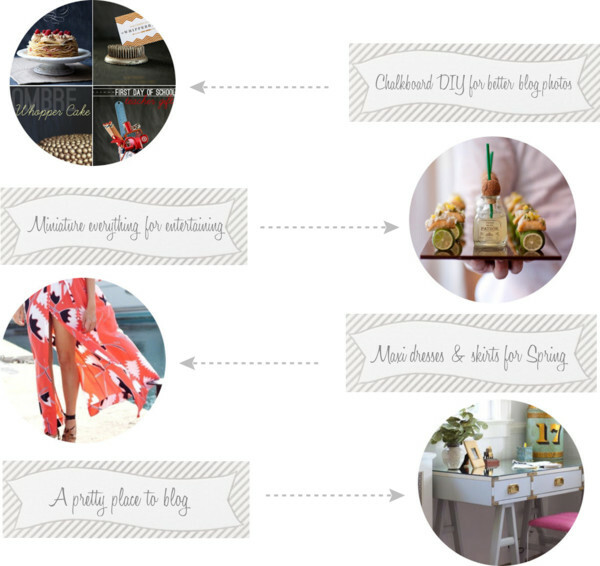 An easy DIY to help create more appealing and original content for the blog. Ideas for entertaining...isn't everything so dang adorable when it's in a petite version??? Refreshing my wardrobe with anything maxi length. I especially am loving something that can be buttoned up the front like that past season DVF maxi dress so you can adjust your desire to show some leg. Finally, a pretty place to work. My current contract at my existing job is up mid-April and I have some soul searching to do on my next path in life. I would love to have my own desk to collect and execute ideas from like that gorgeous campaign desk. What is inspiring you lately?? ?